This is the first in the next batch of ink reviews (all Noodler’s again). 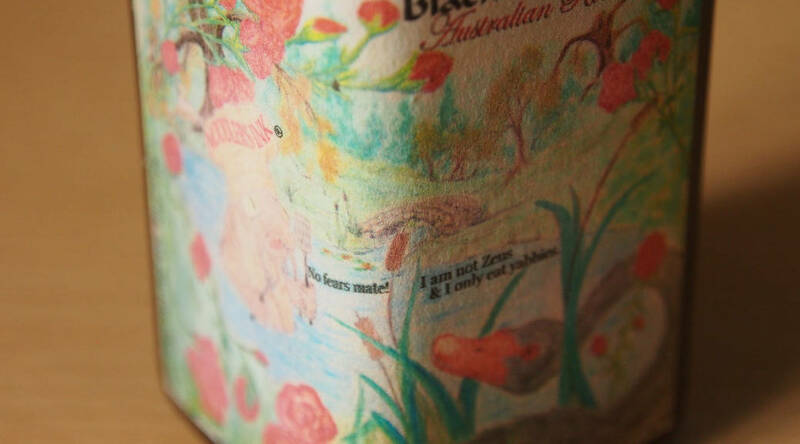 The delay has been a little longer than expected – sorry about that. 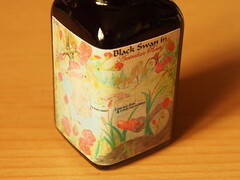 This is a shading ink, designed to show a wide range of colour variation, including the “Black Swan”. 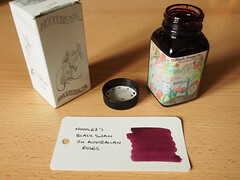 I bought this bottle in June and is the older (less purple) formulation, since it appears to be identical to a sample I bought a year ago. The 3oz bottle was from my favoured Ebay supplier, so I would describe the price as moderate again. 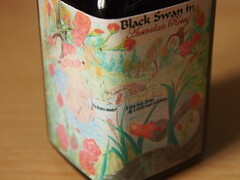 The bottle and box are the usual types. 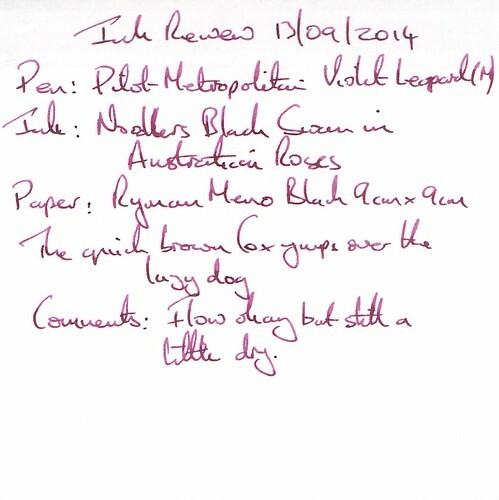 The test pen was a Pilot Metropolitan Violet Leopard with a medium nib.. 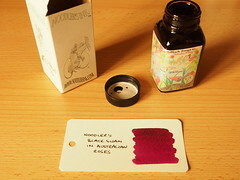 The was some water resistance, although the different dyes clearly have different levels of water resistance. 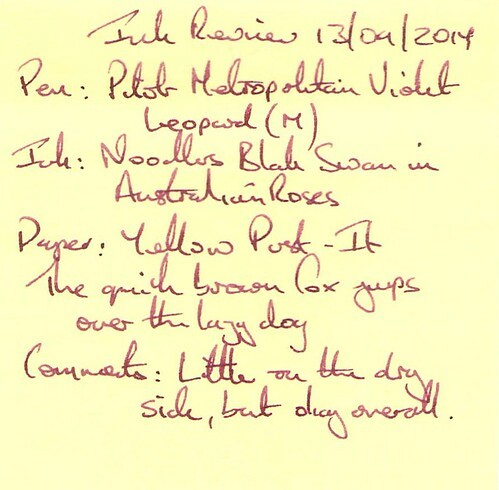 Cleaning was easy enough, but it did have to take a little more care with the feed as there was a dark sooty deposit – the kind I associate more with many black inks. Drying time was about 30 seconds. I’ve written before than I either like my purples to be bright and bold, or dark and brooding. 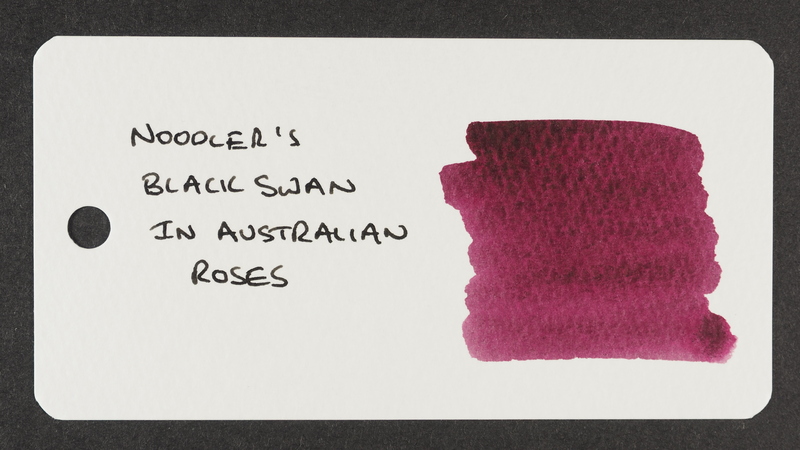 This ink doesn’t really fall into either category, so it is a little bland for. The shading on this paper with this pen doesn’t really stand out either. 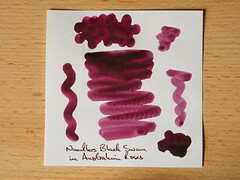 The slightly dry behaviour tempts me to try it ink the Pilot Capless when it next needs refilling. 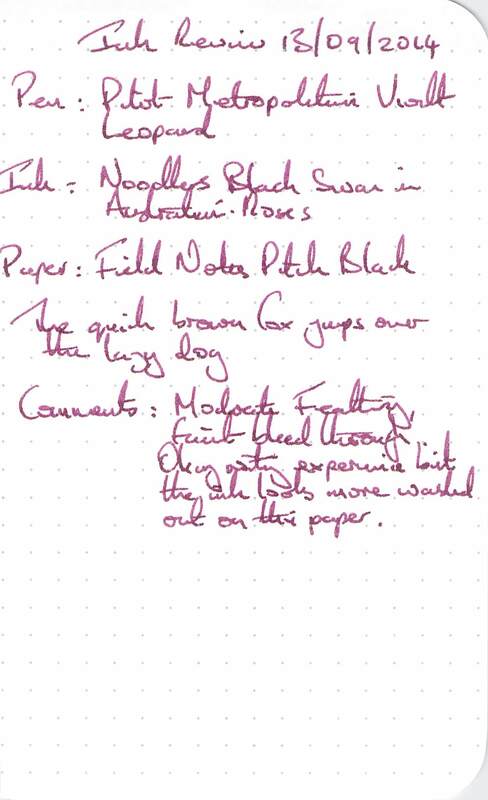 The results are very similar to Rhodia paper. 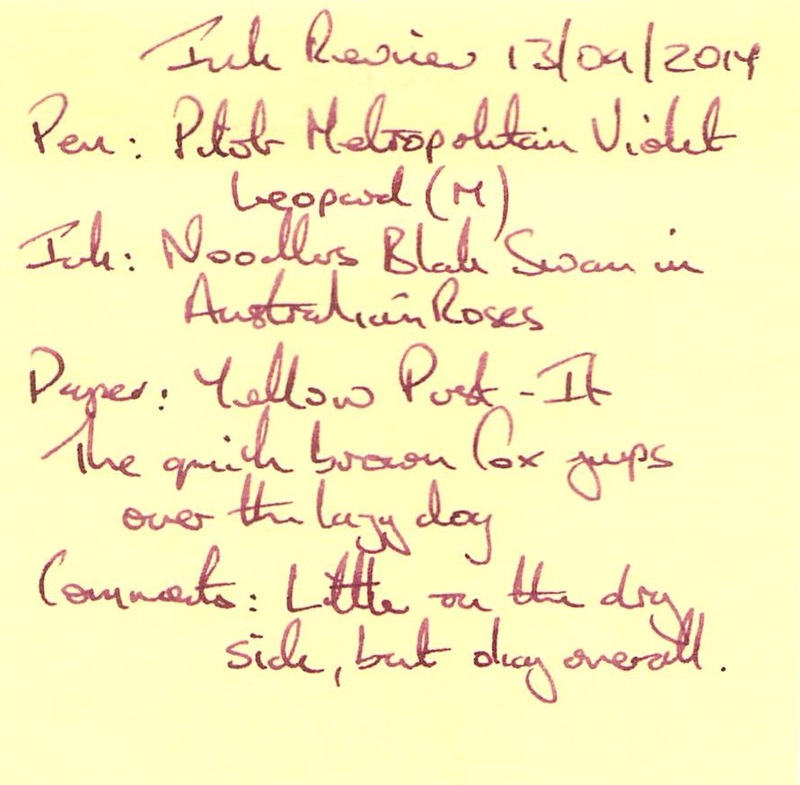 The performance was okay, but I would normally expect purple inks to stand out on a yellow Post-It – and it didn’t in this case. 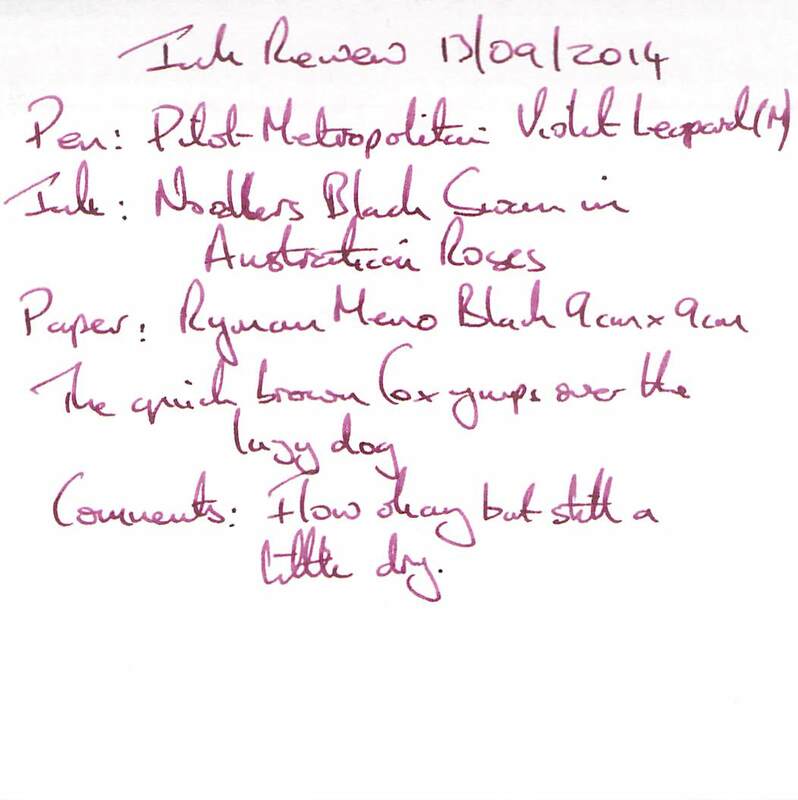 This actually wasn’t too bad at all compared to many other inks, maybe the slightly drier behaviour helped. 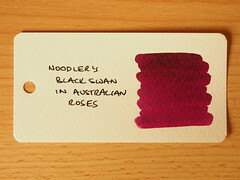 The swatch clearly shows the wine coloured tint, but only hints at the shading this ink is capable of. 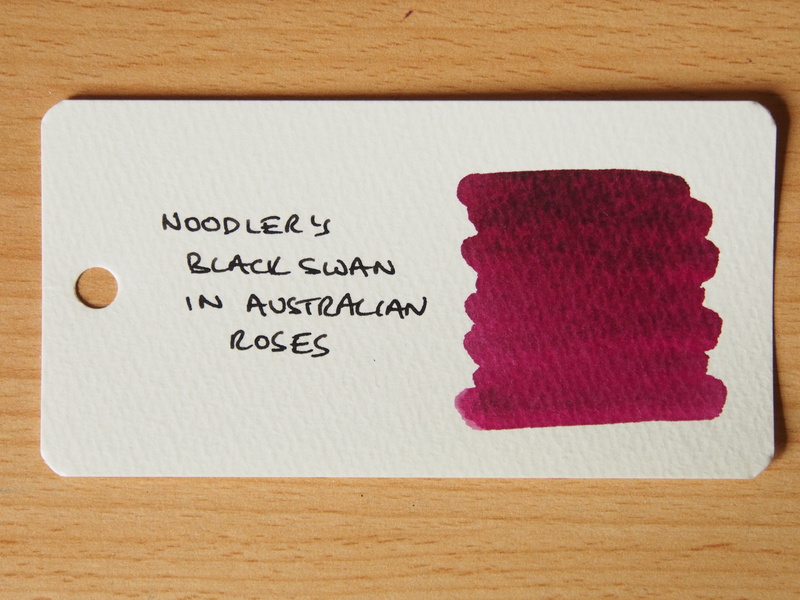 Once combined with the right pen this could be a stunning ink, as shown by the shading sample. 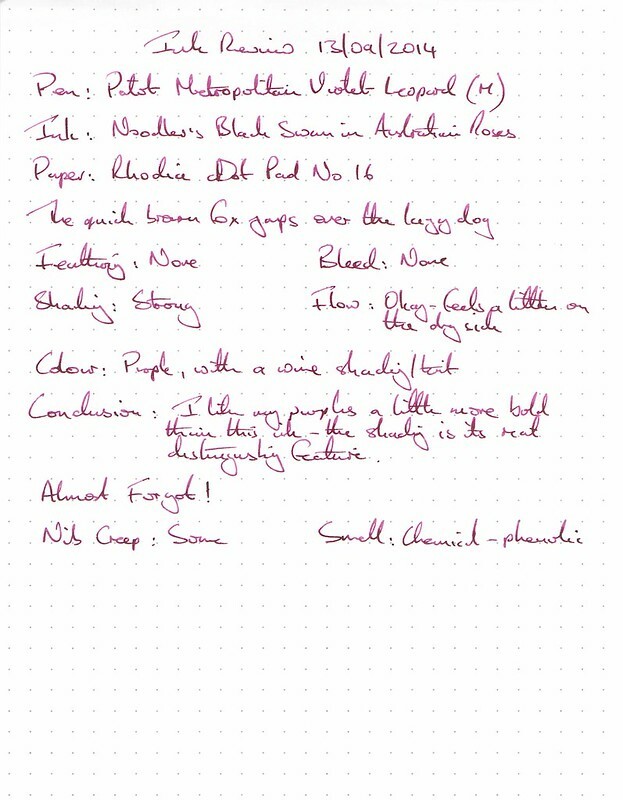 However, in a standard pen it’s a little too bland for me. The new formulation looks closer to the type of purple I like, so I may give that one a try when the opportunity arises. Great job here, man. However, when I discovered this ink, today, I had already ordered Imperial Purple from Diamine. Cheers. Keep the good work up. Thank you for your kind comments. I wish I had more time to post but I do what I can!